Last Saturday I led a bunch of mountain bikers around twenty-odd miles of our local trails, which is something I’ve done plenty of times before. But this time was rather different; we all had one thing in common besides our bikes: we were riding to say a goodbye. At the top of the last descent we stopped not just to admire the view, but to scatter some of the ashes of our good friend Chris Turner. Chris died on 29th June 2014. He was 45. He died of lung cancer less than a year after diagnosis, despite being fit and healthy and a life-long non-smoker. His funeral earlier this summer was attended by hundreds, an indication of how well loved he was. Chris’s mountain-biking friends felt that a ride in his memory would be a fitting additional tribute, so once the summer holidays were over fifteen or so of us met up in Marsden and set off to retrace some of his tyre tracks for a few hours as a way of marking his passing and celebrating his life. I met Chris several years ago through mutual friends in our village, but we only really got to know each other when when one of us gave the other a lift to a group ride organised via the internet (Chris was better known to some as marsdenman on the singletrackworld.com forums). We shared quite a few bike-filled cars after that, and enjoyed a stack of rides together with jaunts up to the Lakes or down to the Peaks, and out to races at Lee Quarry where he helped out with marshalling whilst cheering me on my way to mediocre mid-table finishes. 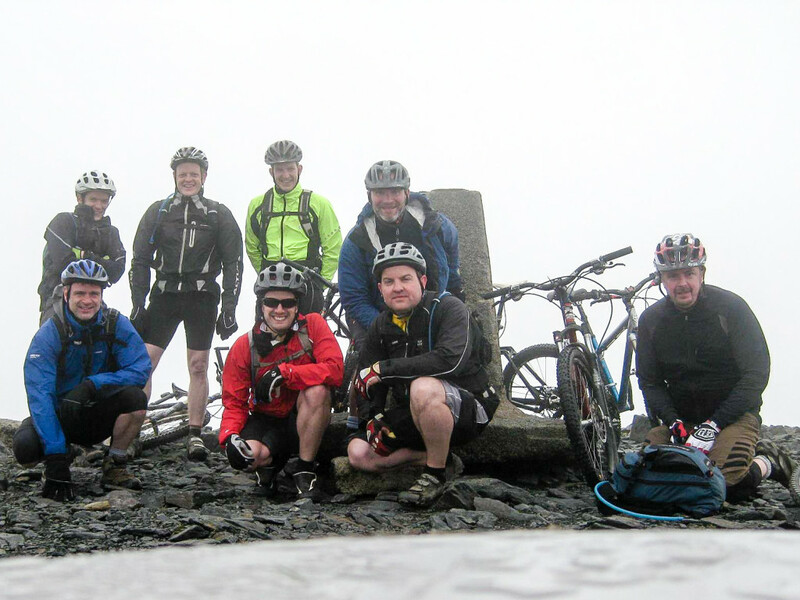 Here’s a shot of the Marsden MTB lads shivering on top of Skiddaw a couple of years back (Chris is front-centre next to some gormless-looking bloke in red). Chris was a talented photographer and his business had been gathering steam nicely until the inevitable change of priorities towards the end of last year; quite a few of the shots of me that are scattered about this site were taken by him. I don’t have many photos of him because if we had a camera on a ride he was usually behind the lens. I do have a couple of videos with him in them. Here’s a helmet-cam edit from a couple of years ago of a ride we did out towards Saddleworth. It was an enjoyable afternoon. The video isn’t in the least bit exciting or remarkable in riding terms, but I’m very glad I kept it now. 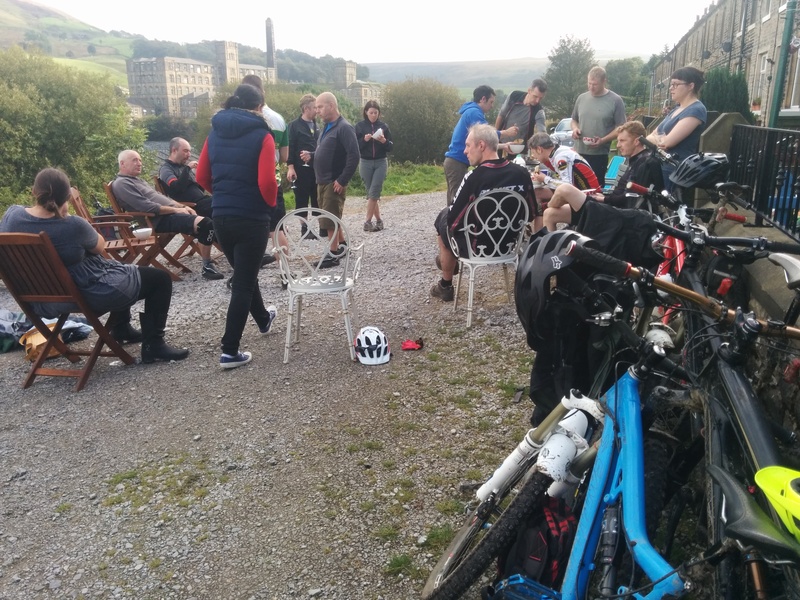 Saturday’s ride was arranged in the same format as the group rides Chris himself organised previously: a three or four hour social ride around the Marsden hills followed by soup courtesy of his wife Sharon, and then a pint or two in the village. Things went off largely without mishap, apart from one early abandon (who later turned out to have a chest infection), and one pretty spectacular crash (seven stitches needed, but he still finished the ride!). The weather was good, apart from a brief spell of drizzle. Sharon and my family met us a few miles from home, and after making our way to the top of the last hill I pulled out the container of Chris’s ashes that I’d carried around the route with me. We scattered them at the top of the Packhorse trail, a spot where we often stop to enjoy the view and catch our breath before dropping back down to the village. There were a lot of tired legs at the end, and I fear my route may have overdone the mileage and climbing for some of the party, but I think everyone was proud to have taken part and all were smiling at the finish. The soup disappeared very rapidly, washed down by some excellent fizz, with which we toasted Chris’s memory. 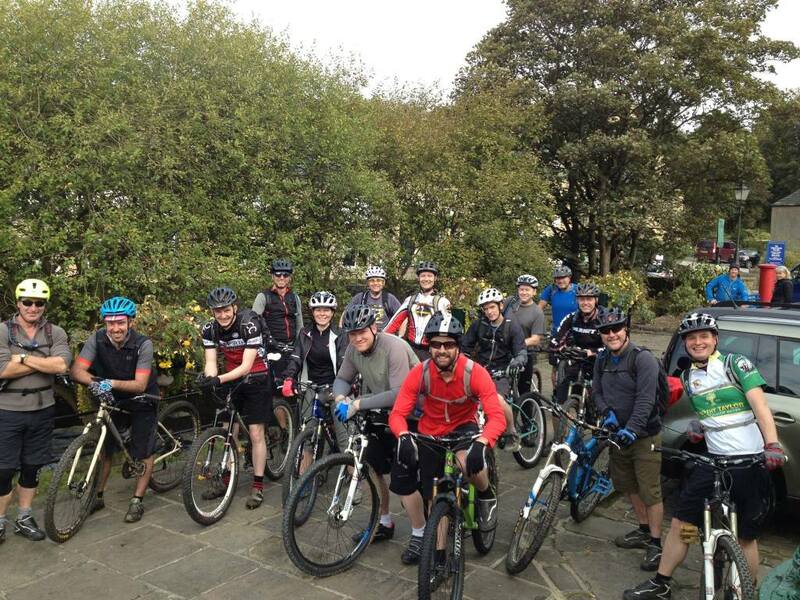 The ride was a lovely way to remember a smashing bloke. Chris was a friendly, open and kind person, always worth spending time with, whether out on the hills or just down the pub. Everyone I spoke to about him on the ride echoed similar memories. Over the last few months of his life he wasn’t able to do much physically, but we tried to keep him amused and included with bike related activities that were compatible with staying sat down. 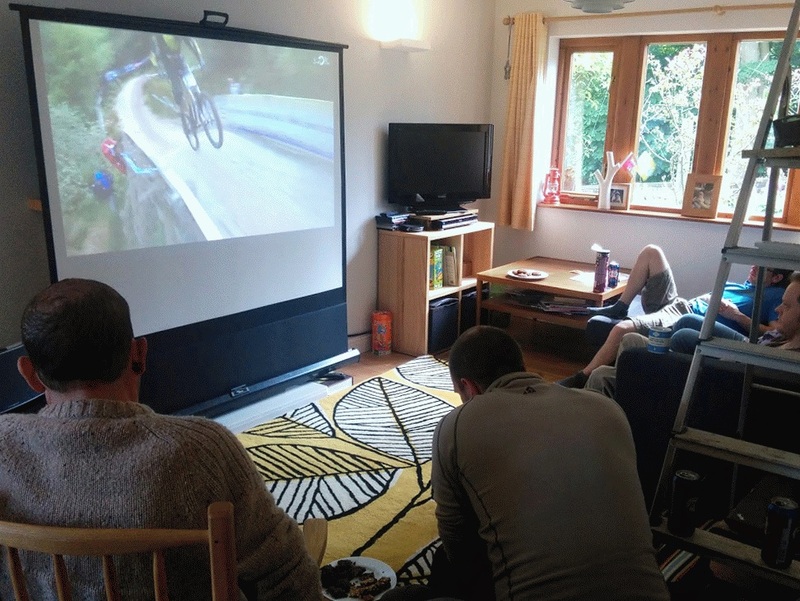 We took him to see the UCI BMX Supercross at Manchester, watched various mountain bike DVDs with friends, and set up our own little Fort William World Cup cinema afternoon just a few weeks before he died. 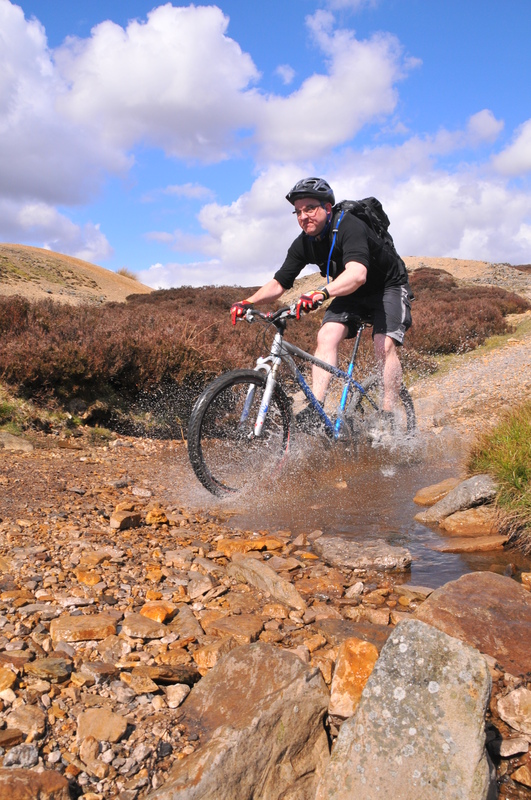 Chris seemed to enjoy chatting about bikes and watching cycling events with his mates throughout his illness, even when he knew that riding again was out of the question. I think he would have approved of our little jaunt around the hills in his honour. It is unspeakably sad that this lovely man died at such a young age and has been taken from those who love him. I am grateful for the privilege of having been able to call him my friend, and for the rides I was able to share with him, even this very last one.